Podium Ortigas Center, top of the range shopping here! Podium Ortigas Center, for the exclusive shopper. The Podium Ortigas Center is surrounded by the Ortigas Business area in Pasig City and has become the favourite venue for power business deals over a cup of coffee or a hearty lunch. A 5-minute walk away from places like Discovery Suites Hotel and the Asian Development Bank, it is conveniently located in the heart of Ortigas. This is the dining and quick shopping destination of choice for businessmen and women who work nearby, and those folks residing near the Ortigas area. With over thirty exotic restaurants, there are plenty to choose from, attracting those who want more than what cafeterias anywhere, have to offer. The Podium is not for those who work with a tight lunch budget. The various restaurants here offer Chinese, Filipino, American, French and Italian cuisine, while price range remains at the bracket of those who can afford to splurge a bit for a plate of crepes, a basket of pastries or bowl of mouth-watering risotto. Dining here is upscale, so be prepared to splurge a little. What sort of shops are in the Podium Ortigas Center? 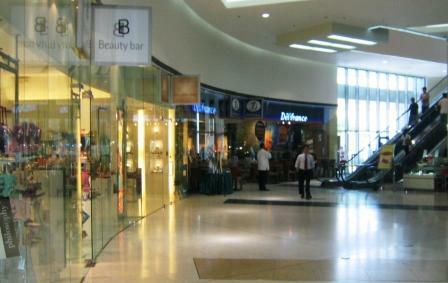 The Podium aims to present itself as one of the best shopping malls to go for high-end shopping. Sure, it has its branch of National bookstore, the country’s largest bookstore, for a quick purchase of inexpensive office supplies and other tidbits, but that’s about as far as inexpensive goes. This isn’t the place to go bargain hunting that is unless you really consider Lacoste an inexpensive boutique for sports shirts. The Podium Ortigas Center stocks up on everything from posh Italian leather goods, international sports houses, to renowned swimsuit lines from Australia. For its relatively small size, compared to other shopping malls in the metro, The Podium holds a lot of weight, though the shops here are geared more on clothing, footwear and accessories. Still, this is definitely not your average shopping mall. This is a place that aims to provide shoppers and patrons with a high quality experience of shopping, dining and entertainment. Housing two mid-size movie theatres, it’s wise to check with the local movie listing just to make sure the movie you plan on watching is showing in one of the two theatres. For great musical performances and such, not so long ago popular singer, Michael Buble, performed here, (Trumpets Philippines, a local theatre group has recently transferred its main office here). Every New Year’s Eve, The Podium has been known to hold a spectacular fireworks display, aside from the fabulous dishes being served during the annual event. How do I get to the Podium Ortigas Center? 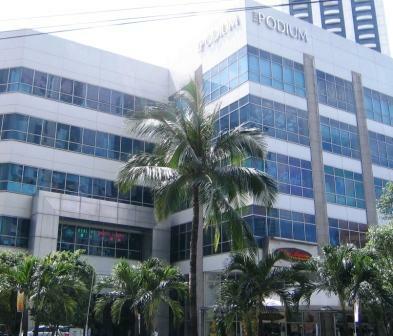 The Podium Ortigas Center is strategically located along ADB Avenue, Ortigas center. It is walking distance within most points in Ortigas like El Pueblo (another mini-mall) and particularly the Ortigas business center and is easily accessible through public transportation such as taxis, shuttle cars, and public utility jeeps. For those concerned with parking their vehicles, no need to fret, The Podium has a relatively large parking area for its size. If you have the money to spend, you should come and visit The Podium Ortigas Center.